Welcome to a new and exciting school year at Aliso Viejo Christian School. Let me introduce you to two of the elementary music teachers – Mrs. Lantz and Mrs. Evans. Marcia and her family have been here in Orange County since 1997. Marcia and her husband, Senior Pastor Leland Lantz, helped plant this church and school in 1999 on a dirt lot with lots of weeds and ants! It is such a blessing to be a part of this ministry and to see it grow each year. 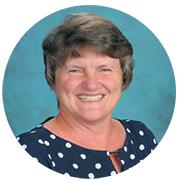 Marcia has taught for over 25 years in both public and private schools and has been teaching and subbing at AVCS since 2009. She grew up in Nebraska and received her Bachelor of Science degree in Elementary Education with a minor in Music. She also has a Master’s Degree in Elementary Education. Pastor Leland and Marcia have two adult children – Emilie and Jonathan and are blessed to have a grandson, Thomas Finn born in 2016. Marcia began her musical training in 2nd grade with piano lessons followed by voice lessons. She started playing clarinet in the 4th grade and continued playing in the marching band throughout college. She has taught private piano lessons and helps lead a worship team once a month in a jail ministry since 2007 at Theo Lacy facility in Orange. She is on the worship team here at Lutheran Church of the Cross and has played keyboard for several women’s retreats. Marcia began playing hand bells in 5th grade and directs the JuBellation hand bell choir here at church. Her family has a passion for mission work and has traveled on several mission trips to Bolivia, Czech Republic, Guatemala, and Mexico.